Three Australians road-tripped across America over the last few years, exploring some of our country&apos;s most bizarre, inspiring and fascinating subcultures. The best part is that you get to follow their adventures from the comfort of your own home. Pawel "Parv" Jarecki, Tim "Gonzo" Ryan and Nick Maher make up the DIY team of Unplanned America, a docu-series that just had its third-season launch on Netflix. You can also catch the other two seasons—which have covered everything from the off-the-grid community of the California desert&apos;s Slab City, to the real-life, costumed superheroes of Seattle and gang tattoo culture of L.A.—on the streaming platform. LAist caught up with Ryan and Maher while they were in L.A. taking meetings with production companies to kick around some ideas for new projects. 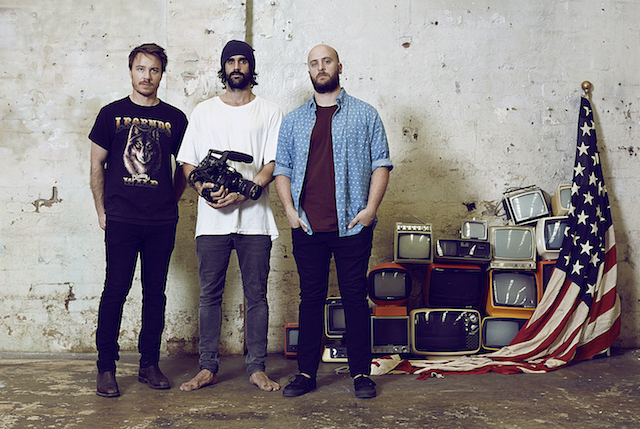 It&apos;s been a long journey for this trio, who previously worked as creative producers at MTV Australia. 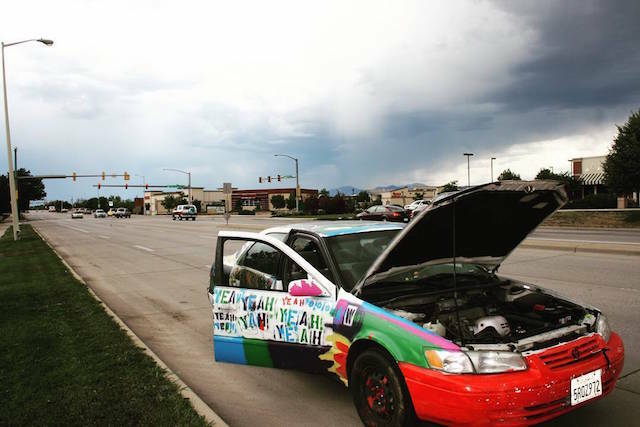 They first started road-tripping in the United States in 2012 in a colorfully painted Toyota Corolla without any concrete plans and barely any budget. In their project&apos;s early days, Jarecki lived in a tent for six months, Maher slept on a friend&apos;s couch for nine months, and Ryan had moved back in with his parents. On the road, they often crashed on people&apos;s couches or floors, stayed in tents on the side of the road and slept in the dingiest motels, one of which had an online review of, "My brother was stabbed here." "We&apos;ve shared too many beds together for two people that aren&apos;t a couple making this show," Ryan says, looking at Maher. Even though their show got bought by Australia&apos;s SBS2 network, and picked up by Netflix, they say it&apos;s still a very low-budget production and things haven&apos;t changed very much. However, they were able to hire a cameraman, another MTV Australia alum, for the latest season. They filmed both seasons 2 and 3 together just because of budget constraints and went hard on the road for four months straight. Ryan equates their filming life to being like an indie band on tour. It&apos;s this punk-rock approach to their work that leads them to fascinating and organic adventures. Like in season 1, after staying at a "friend of a friend of a friend&apos;s house" in Colorado, Ryan says they were tipped off about a cryogenically frozen corpse in a nearby mountain town. They, of course, checked it out and found the body. Ryan and Maher say they&apos;re especially proud of season 3, in terms of their filmmaking approach and the engaging topics they covered. In one episode, they got deep into the hop topic of guns in the United States. Ryan and Maher, who themselves lean towards being liberal and anti-guns, got out of their comfort zone and went straight into the "belly of the beast" in the South, and found "people with a shitload of guns," Maher says. 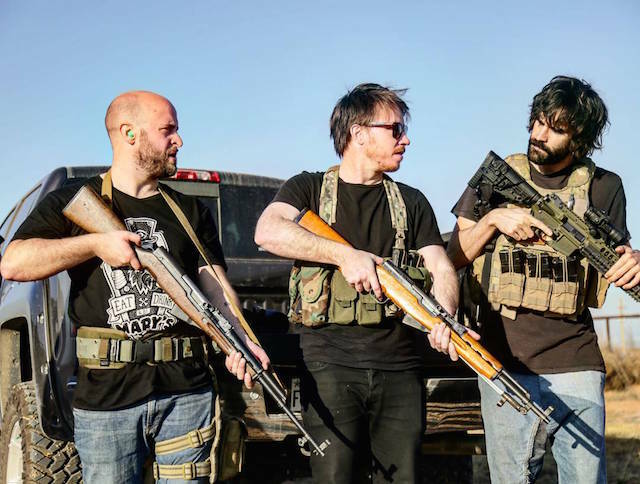 They spent time with a Texas militia and a Virginia open-carry group. Ryan recalls how they went out to lunch with eight people who were all sitting with guns in their pockets. One member even had a gun that he could pop out of his belt buckle; it could shoot one bullet. "That was one of the more surprising episodes we&apos;ve done just in terms of seeing different perspectives and getting a bit more of an understanding [of the situation]," Ryan says. "It&apos;s just such a complex issue." 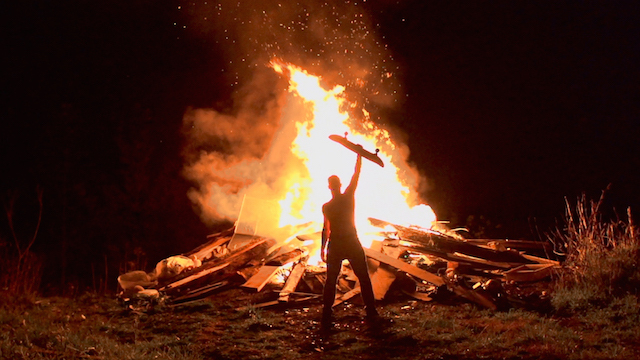 The crew also inserted themselves into Skatopia, an anarchist skater community in Ohio&apos;s Appalachians, where misfits threw intense ragers and would set cars on fire, but found solace in building the gardens and skate ramps there. They went out to Colorado and visited a so-called "cannabis shaman." "That&apos;s the one where we thought we were going to die, through eating copious amounts of marijuana and then going on these trance ceremonies," Ryan says. Maher says because they rarely smoke weed, eating the edibles were too intense for them and made them all paranoid. Since the ceremony took place in just a plain mansion without any real spirituality in it, "that made us sort of feel a bit weird." "We basically thought we had walked into a cult and been drugged," Ryan says. However, everything turned out fine, as things usually do for the guys. They chalk it up to their disarming Australian accents and the fact that they&apos;re good listeners. "As always, we found out that they were good people," Maher says. "We&apos;d be scared—this happens with every place we visit. We&apos;re trepidatious at the start. Inevitably, we&apos;d be pleasantly surprised by the people who take us into their world." One of the most interesting episodes in this season is one where they visit a place in New Mexico that&apos;s dubbed the "United State&apos;s biggest open-air mental asylum." It&apos;s a place, very much like Slab City, where people can live off the grid—but on a much larger scale. Many homeless, war veterans and people with mental health issues build their own structures to live there. They interviewed several people in the community, and noted that "there&apos;s a sense of danger" in the area. "But then again they&apos;re just good people trying to get by," Maher says. "We&apos;re chilled-out people who listen, so it&apos;s probably not dangerous for us, but there would&apos;ve been some shootouts." Maher is talking about about how the people who live there have to enforce their own set of laws because actual police seem leery of stepping foot in there. People can get kicked out of the area through a community vote, and "there was a suggestion that people can &apos;disappear&apos; if they are really bad," he says. I&apos;d say the system as a whole is often against those people. It&apos;s the disparity between the rich and the poor. The poor are still thinking that the American dream is happening and they&apos;re trying their asses off to achieve it. They live authentic lives and do inspiring things, but then as a whole the country isn&apos;t really set up for those people anymore, so they often don&apos;t get there no matter how hard they work. So, it&apos;s a little tragic that way, but that spirit of the individual is really strong in America and it&apos;s strong in the people that we meet—and that&apos;s a massive, positive thing. "Even though you don&apos;t agree [with them], as cheesy as it sounds, at the end of the day everyone&apos;s just people and they still have the same wants and are just trying to make a better life for themselves," Ryan says. The guys feel they&apos;ve filmed enough content in America and are ready to move on to their next adventure, possibly even starting an Unplanned World. Ryan still looks back and is amazed by the whole adventure. "A show that we made back in the first place traveling around, not really sure what we were doing...suddenly people are able to see it in America." Seasons 1, 2 and 3 of &apos;Unplanned America&apos; are currently streaming on Netflix.